Sometimes the heavens align for us beauty writers. At the exact moment we have a beauty "issue", there's a new beauty product on our doorstep to treat it! In my case it was the new IT Cosmetics Bye Bye Breakout Full Coverage Treatment Concealer. I had just starting treating an "out-of-the-blue blemish" on my cheek and was in need of some additional cover up. 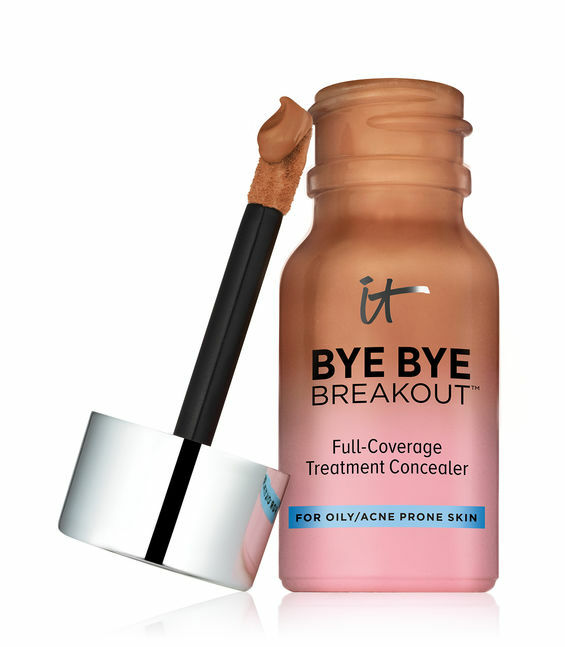 Bye Bye Breakout Full Coverage Treatment Concealer was truly impressive. It is weightless and at the same time, very concentrated and pigmented. This concealer not only covers up blemishes and pimples, but it also includes ingredients to treat the acne and help shrink the size of active pimples. How is it able to do this? It's made with proven acne fighters: salicylic acid, kaolin, sulfur, retinyl palmitate (a retinol derivative), and glycolic acid to smooth skin. These ingredients are combined with soothing ones, like zinc oxide (a skin protectant), hyaluronic acid (which keeps moisture in the skin), as well as vitamin E, ceramides, and aloe. My color match was perfect for summer, Deep, and the texture was creamy and smooth. I loved the tiny sponge applicator included in the cap, which made dotting a pin-drop sized amount it on my blemish simple and quick (it also works well with a concealer brush if you prefer). The formula dried down within seconds and my blemish was completely covered. It worked well both over my foundation, as well as on bare skin when I had a natural look on the weekends. Note: While this can be used as an under eye concealer (and it did a good job covering under eye circles too), it is primarily meant for the most common areas where pimples form, cheeks, nose, chin and forehead. *This product was provided courtesy of IT Cosmetics for reviewing purposes.